Largest nations on Earth converge to support embattled Syrian government. August 11, 2012 - Iran has recently hosted 30 nations including Russia, China, India, Pakistan, Indonesia, Sri Lanka, Ecuador, Afghanistan, Algeria, Iraq, Oman, Turkmenistan, Venezuela, Cuba, Jordan, Tunisia, Palestine, and many others in Tehran this week in efforts to support the Syrian government against foreign destabilization. Upon the agenda were calls to end foreign arms currently flowing into terrorist hands inside Syria, proposals to broker a meaningful ceasefire, the coordination of humanitarian aid, and supporting the Syrian people's right to reform without foreign interference. 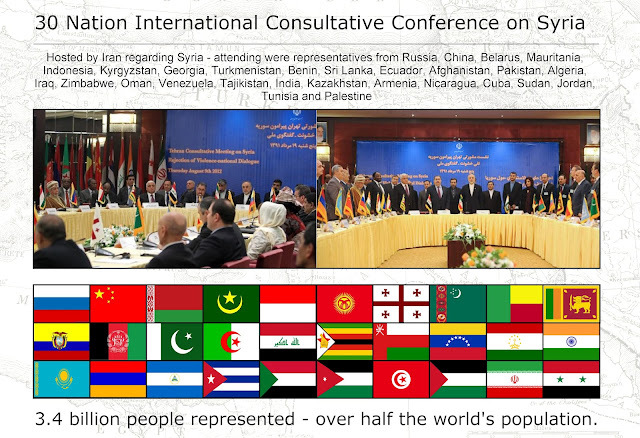 The unique conference featured representatives of over half of the world's population, and signals that indeed, Syria's government is not as "isolated" as portrayed by Western neo-imperialists. The meeting comes as revelations emerge that the United States, United Kingdom, NATO-member Turkey, and members of the Gulf Cooperation Council (GCC) are supplying weapons, cash, and other assistance to foreign militants with direct links to Al Qaeda. These include Libyan Islamic Fighting Group (LIFG) militants who are in fact listed by both the US State Department and the UK Home Office (page 5, .pdf) as a foreign terrorist organization and a proscribed terrorist organization respectively. As foreign militants continue to flow over Syria's borders bolstered with an increase in foreign aid, sectarian violence has spiraled out of control. The UN has categorically failed to condemn the West's state sponsorship of international terrorism now ravaging Syria. It appears that nations around the world, including shareholders in the Anglo-American establishment, may be having second thoughts about the increasingly untenable enterprise the West has chosen to pursue. Earlier this month, during a Saudi-Qatari sponsored, US-UK-backed UN resolution, a large number of nations either voted no, abstained, or failed to attend the vote, indicating slipping support for what is sometimes called the "Washington consensus." 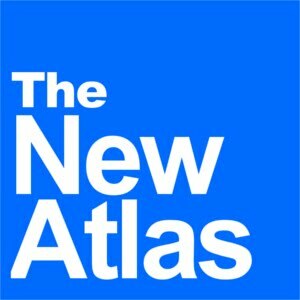 US, GCC, and NATO actions in Libya in support of sectarian militants to install a stable of Western-created proxies into power has stripped away much of the "primacy" of "international law" and left the willfully abused geopolitical tenant of "responsibility to protect" (R2P) irrevocably in tatters. With the West's attempted destabilization of Syria stalled, global public opinion has grown aware of the true nature of Syria's so-called "rebels," and that many are foreign fighters committing an array of abhorrent atrocities. The UN's failure to act, or even worse, its role in facilitating what equates to military aggression couched in "humanitarian" pretenses, jeopardizes international law all together. "The Syrian rebels would be immeasurably weaker today without al-Qaeda in their ranks. By and large, Free Syrian Army (FSA) battalions are tired, divided, chaotic, and ineffective. Feeling abandoned by the West, rebel forces are increasingly demoralized as they square off with the Assad regime's superior weaponry and professional army. Al-Qaeda fighters, however, may help improve morale. The influx of jihadis brings discipline, religious fervor, battle experience from Iraq, funding from Sunni sympathizers in the Gulf, and most importantly, deadly results. 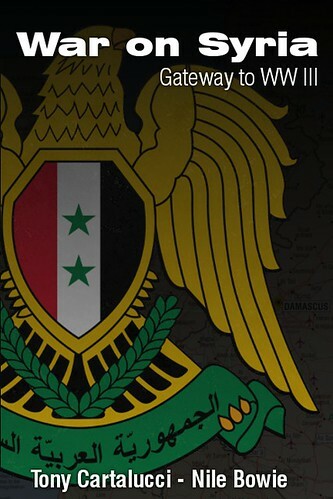 In short, the FSA needs al-Qaeda now." Clearly, no nation in good conscience, or at least interested in self-preservation, could condone the overt destabilization of Syria by foreign powers with disingenuous motives, using listed-terrorist organizations to do so. The potential of this same ploy then being turned against other nations including members of Iran's 30 nation conference, or even the US and UK's "Friends of Syria" confabs, becomes increasingly more likely if such tactics are not condemned and altogether balked. While US Secretary of State Hillary Clinton talks of "no-fly zones" with NATO-member Turkey this week, the successful conference in Tehran illustrates that any such act of aggression will be carried out unilaterally, further undermining the West's own contrived "international order" with a growing number of nations standing in direct opposition, not in support of, Wall Street and London's next move. Iran plans to hold another such conference later this month. For more information, please listen to the first half of Dr. Webster Tarpley's August 11th broadcast of World Crisis Radio.